If you like movies and you have an abiding interest in financial reform, head over to Theatre N this weekend to see the documentary "Inside Job," which plays Friday at 2:00, Saturday at 2:30 and 8:30, and Sunday at 5:00. The density of information and the complexity of the subject matter make “Inside Job” feel like a classroom lecture at times, but by the end Mr. Ferguson has summoned the scourging moral force of a pulpit-shaking sermon. That he delivers it with rigor, restraint and good humor makes his case all the more devastating. There will be a discussion after the Saturday evening showing, which will include Greg Wilson, communications director for the Delaware Reinvestment Action Council. Greg led the effort here in Delaware to lobby for meaningful financial reform last year. We got a pretty good bill (thanks in no small part to Ted Kaufman), but regulations are still being formulated to implement the law. Floyd Norris of the New York Times wrote a week ago that the regulations requiring banks to keep some "skin in the game" when offloading most mortgages may turn out to be pretty good. We need to pay attention to how these regulations play out. And if you need a refresher on why it matters, go see "Inside Job." Tell 'em TommyWonk sent you. Mr. Peterson helped lead a task force whose work contributed to the global phase-out of chlorofluorocarbons, the organic chemicals widely used as refrigerants that contribute to depletion of the ozone. The best-known fluorocarbon is Freon, a DuPont product. 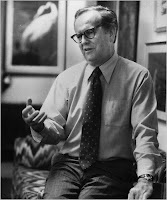 In addition to being the president’s principal adviser on environmental policy, Mr. Peterson helped shape the extensive environmental reviews, known as environmental impact statements that were mandated by the National Environmental Policy Act of 1970. Governor Peterson would hold an honorable place in Delaware history if his legacy had ended on his first day in office, when he pulled the Delaware National Guard out of Wilmington. He went on to replace the moribund commission system of state government with a cabinet system, enact the Coastal Zone Act and tear down the last whipping post in the United States. He prompted Republican presidents to push for progress on the environment, and continued to be an effective advocate for the earth for decades to come. He had a tart tongue at times, and along the way he had practical people explaining that whatever he set out to do just couldn't be done. But Russ Peterson had a remarkable ability to take on difficult issues and succeed. His engagement in the fight to bring wind power to Delaware gave us all a sense that this was another long shot that just might pay off. Like many Delawareans, I have crossed paths with Russell Peterson often over the course of decades. I handed out leaflets for the Coastal Zone Act as a kid. When I was in the mayor's office, I worked with the Rivers Task Force he led that prompted the redevelopment of Wilmington's Christina waterfront. 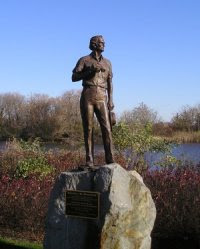 Later I helped raise money for the Russell W. Peterson Urban Wildlife Refuge, where this statue stands. I spoke with him just before he announced he was switching from the Republican Party to the Democratic Party in 1996. (He said he couldn't stand to be in the same party as Newt Gingrich.) More recently, I was proud to be on the same side as Russ Peterson in the fight to bring offshore wind power to Delaware. I could say a great deal more. At this moment, I'm thinking about how he kept pushing, always moving on to the next cause or project. This in a way was his most inspiring quality, and gives me cause to think about what more I can do in my time here on earth. People instinctively know that renewable energy creates benefits by reducing pollution from dirty power plants. But can we back up what seems like a common sense assertion with hard figures? The answer is yes. We now have an estimate of these benefits, and the source of the calculation might surprise you. Every two years, Delmarva Power is required to submit an Integrated Resource Plan (IRP) to the Public Service Commission. In the IRP, Delmarva Power details how it plans to meet its customers' needs and ensure the reliability of service. The latest draft IRP (PSC Docket No. 10-2) was filed December 1, 2010. The draft IRP presents a summary of the impacts of a variety of emissions reductions programs, and, for the first time, includes a calculation of the environmental externality costs and benefits of these programs. An externality is a cost or benefit that does not show up in a company’s financial results, but is instead imposed on a third party. For instance, a company that cuts costs by not controlling air emissions creates costs for those who breathe the resulting dirty air. A prominent obstacle to a level playing field for clean energy is that the external costs (e.g., environmental degradation and public health impacts) of using fossil fuel resources are not fully paid by energy generators, distributors or ratepayers, and are not and reflected in the price of the energy resource. The draft IRP estimates the environmental impact of Delaware’s Renewable Portfolio Standard, the Energy Efficiency Resource Standard, the state’s participation in the Regional Greenhouse Gas Initiative (RGGI), the planned Bluewater Wind offshore wind project, other renewable energy sources coming on line, and a sharp reduction in emissions from coal burning power plants in Delaware. The draft IRP presents an estimated economic benefit of these changes in power generation in Delaware, and it’s big: $1.8 billion to $4.3 billion over the next ten years. The figure is based on epidemiological estimates for health effects (such as lung disease and cancer) of reduced emission of NOx, SOx and particulate matter from power plants. That comes to roughly $2,000 to $4,750 for every Delaware resident over the next ten years. You may never know if you would have gotten sick from the pollution removed from the air in the coming years. But significant numbers of your friends, families and neighbors are likely to remain healthy over the next decade because of Delaware's commitment to cleaner energy. In annual terms (the calculation includes discounting for future dollars), the benefits total to $180 million to $430 million per year. Using Energy Information Administration (EIA) figures, I calculate the health benefits of adopting the renewable energy programs mentioned above come to 12 percent to 30 percent of Delaware’s 2008 retail electricity sales. Opponents of renewable energy assert that green energy is too expensive, though the estimates of the “green premium” are generally overblown and rather lacking in detailed analysis. Now we have a calculation of the benefits, and the results affirm that Delaware’s policies promoting renewable energy are economically sound. 1. Support and enhance the ongoing advocacy work of Delaware’s environmental organizations. 2. Promote coordination among Delaware’s environmental organizations. 3. Where needed, foster new collaborative efforts among environmental advocates. 4. Engage new partners in environmental advocacy. 5. Give participants specific opportunities to engage in effective advocacy. 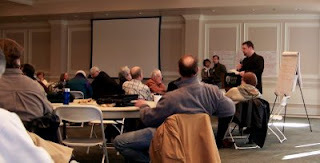 These group discussions are being designed to cover the issues and make plans for the coming year. If you have issues that do not clearly fit into any of these categories, please let us know. We are asking organizations to contribute $25 (covering all members of that organization) and unaffiliated individuals $5 to defray the cost of the Summit. Please bring your check (payable to Delaware Chapter, Sierra Club) or cash with you to the registration table at the Summit. The Dover campus of Wilmington University is located on Route 13 North (at Scarborough Road), at the intersection of Exit 104 from Delaware Route 1, just north of the Dover Mall and Dover Downs. To RSVP or ask a question, contact us at DelEnviroSummit@gmail.com. We are taking money from the poor and giving it to the rich! Misguided energy policies have put the state in the role of the anti-Robin Hood. The green premium this time is said to be at least 20 percent of household energy bills—though once again no analysis is offered to justify the number. Reference is made to the Regional Greenhouse Gas Initiative (RGGI) and Delaware's renewable portfolio standard, without offering any analysis as to how—and how much—these programs will raise our energy bills. Actually this version of the green premium is rather modest compared to a previous assertion that renewable energy programs would cost $1,000 annually per residential customer “if all the legislated policies were in effect now.” As I calculated last month, this would come to a whopping 63 percent of the average residential bill in 2009. Whether the number is 20 percent or 63 percent, the CRI doesn't show us the analysis to back up the scary numbers. Since the CRI seems disinclined to do the math, I thought I would take a stab at it, starting with Delaware’s biggest renewable energy effort: the Bluewater Wind offshore wind project. The Public Service Commission’s consultant in 2008 projected the levelized cost of the Bluewater Wind contract to be 70 cents per MWh (0.07 cents/kWh) over the 25 year life of the deal. Based on average electricity use in 2009, this would come to 65 cents per month or $7.82 per year. (This figure could go up or down a few dollars depending on the trajectory of fossil fuel prices over the next three decades.) For those keeping score at home, that comes to 0.49 percent—which leaves the CRI to detail how renewable energy policies will raise our bills the other 19.51 percent. Here's a conundrum for armchair economists when it comes to monetary policy: With so many more dollars flowing into the economy, why haven't we seen inflation accelerate? The Federal Reserve has expanded its balance sheet (the amount of liquidity in the economy) from $927 billion on September 10, 2008 to $2.47 trillion on February 2, 2011. And the Fed is pumping more money into the economy through its ongoing quantitative easing program. But the consumer price index for 2010 was a modest 1.5 percent. The answer has to do with the velocity of money. If the definition of inflation is too many dollars chasing too few goods, then inflation is a function of the motion of the dollars. If the dollars aren't chasing the goods very hard, we won't see higher inflation. Here M is a measure of the money supply, V its velocity, and nominal GDP is written as the product of the overall price level (P) with real GDP (Y). Yes, there are more dollars in the economy than there were before the meltdown in the fall of 2008, but these dollars haven't been moving very fast. Households experiencing unemployment or foreclosure are hoarding the few dollars they have. Those who still have jobs have been either paying down debt or building up savings. A dollar in a mattress, by definition, isn't moving very fast. In his speech to the U.S. Chamber of Commerce, President Obama noted that American corporations "have nearly $2 trillion sitting in their balance sheets." Obama wants CEOs to deploy these assets, which have been sitting doing very little, by lending, spending and hiring more. Profitable corporations have been hoarding their earnings and are still reluctant to hire new workers or invest in capital equipment. Banks that were bailed out with government funds are still rebuilding their balance sheets and have been slow to start lending again. A dollar that isn't being used to buy goods or hire workers isn't going to drive prices or wages up. The reality is that the Obama administration's agenda has been, and continues to be, quite pro-business. He presided over TARP, the rescue of the American auto industry and a stimulus bill that the Chamber of Commerce endorsed. The administration passed a health-care law the chamber hated but that won official neutrality or support from the insurers, pharmaceutical companies, hospitals, doctors, and even the Business Roundtable, and disappointed liberals who sought a public option or a single-payer program. And as we know, corporate profits and stock prices have been the first part of the economy to return to health. Toward the end of the 1930s, amidst depression and the looming prospect of war, President Roosevelt realized he would need to form a new partnership with business if we were going to become what he would call the “arsenal of democracy.” As you could imagine, the relationship between the president and business leaders had grown somewhat fractured over the New Deal. So Roosevelt reached out to businesses; and business leaders answered the call to serve their country. After years of fighting each other, the result was one of the most productive collaborations between the public and private sectors in American history. Some, like the head of GM, hadn’t previously known the president. If anything, he had been an adversary. But he gathered his family and explained that he was going to head up what would become the War Production Board. In the years that followed, automobile factories converted to making planes and tanks. Corset factories made grenade belts. A toy company made compasses. A pinball machine maker turned out shells. 1941 would see the greatest expansion of manufacturing in the nation’s history. And not only did this help us win the war. It led to millions of new jobs and helped produce the great American middle class. Obama isn't interested in CEOs taking on more charities. He wants America's biggest corporations to take the the profits they've been salting away and start investing and hiring again. For some on the right and the left, Obama and corporate America are, and should be, enemies. But if the greatest task facing the U.S. is increasing employment, then it is natural that Obama, like Roosevelt, should seek to work with the folks who have the tools and the capital to put Americans back to work. Despite the sound and fury from tea party conservatives, most Americans want the government to protect us from polluters and promote renewable energy. Last week Newt Gingrich proposed abolishing the Environmental Protection Agency (EPA), and replacing it with a more business friendly Environmental Solutions Agency. The NRDC did some polling, and found that only 25 percent support Newt Gingrich's proposal. Even a majority of Republicans opposed Gingrich's idea. A recent Gallup poll found that promoting alternative energy is the most popular of eight legislative initiatives surveyed, more popular than fixing the tax code. Fully 83 percent of those surveyed said that Congress should "pass an energy bill that provides incentives for using solar and other alternative energy sources." Only 15 percent opposed the idea. A record 28.7 million people traveled on Amtrak passenger trains in fiscal year 2010. Despite this, Congressional Republicans have targeted federal support of passenger rail transportation for elimination. Overall, the Spending Reduction Act of 2011 that has been proposed by the Republican Study Committee would end $1.565 billion in annual federal operating subsidies for Amtrak as well as $2.5 billion in intercity and high speed rail grants. The elimination of Amtrak’s federal subsidy could result in the end of inter-city passenger rail operations in the United States. In so doing, Congressional Republicans risk sacrificing our nation's long-term interests in favor of a rigid, doctrinaire, adherence to ideology. Amtrak (formally known as the National Passenger Rail Corporation) is a government-owned corporation formed in 1971 by the Nixon administration to take over increasingly unprofitable intercity passenger rail service that had previously been operated, at a significant loss, by private railroads. It has been heavily dependent on federal subsidies throughout its entire existence. Amtrak, and funding for passenger rail projects in general, has long been a target of conservatives. In particular, conservatives point to Amtrak’s dependence on federal subsidies and its inability to be “self sufficient” or “profitable.” For many on the Right, “subsidy” is simply a dirty word. When it comes to passenger rail, conservatives are in desperate need of a paradigm shift; instead of framing the debate in terms of “self sufficiency” and profitability, conservatives should focus on the economic value of strategic investments in our transportation infrastructure. Simply put, no passenger rail system in the entire developed world is “self sufficient”- all require some form of public support. However, this is not a condemnation of passenger rail. Self-sufficiency is not the standard we utilize to gauge the value of other transportation modes in our economy. Both civil aviation and our nation’s highways benefit from a range of public subsidies and support- both direct, and indirect. Indeed, a case can be made that civil aviation is one of the most heavily subsidized industries in our nation today. In the end, passenger rail provides a public service. And profitability, or “self sufficiency,” is not the most useful metric when gauging the value of public services. In addition, passenger rail provides a number of benefits to our economy. It plays a critical role, particularly in the Northeast Corridor region and in California, in reducing traffic congestion on our roadways, it reduces pollution and gasoline consumption, and it helps to reduce overall travel costs. These benefits would only increase if critical investments in modernizing our rail infrastructure, such as the High Speed Rail Corridors projects, were made. In 2008, Congress passed the Passenger Rail Investment and Improvement Act (PRIIA) which, among other things, established a high-speed rail corridor development program. The viability of many of the designated high-speed rail corridors is amply documented by research—indeed, many of these projects have been on the drawing board, or under consideration, for years. PRIIA represented a forward-looking, strategic, investment in our transportation infrastructure- one which will bring significant economic benefits to a diverse range of communities across the nation. In his recent State of the Union speech, President Obama reaffirmed his commitment to high speed rail, saying "[w]ithin 25 years, our goal is to give 80 percent of Americans access to high-speed rail." The President’s vision of developing a state-or-the-art high speed rail passenger system is one Republicans should embrace. The High Speed Rail Corridors project is a long overdue recognition of a simple fact: a modern transportation system requires a modern infrastructure. In a way, it is to passenger rail what the development of the Interstate Highway system was to the automobile. It’s time for conservatives to reconsider their historic opposition to federal funding for passenger rail. As Kummant has noted, “[t]he current approach of the right, basically ignoring the national competitiveness implications of transportation and the related energy issues, is an abdication of responsibility.” Striping a critical link from our nation's transportation system at this juncture will impede economic growth and recovery, and damage our competitiveness; and that is the last thing we ought to do. Indeed, today—a time of rising fuel costs and increasing global economic pressures—is actually the time to invest in developing a state-of-the-art 21st Century passenger rail infrastructure that will be the envy of the world. Michael Stafford is a Wilmington, Delaware attorney and a former Republican Party officer who led the local party organization's Transportation Working Group during 2009 and 2010. WASHINGTON — When he releases his new budget in two weeks, President Obama will propose doing away with roughly $4 billion a year in subsidies and tax breaks for oil companies, in his third effort to eliminate federal support for an industry that remains hugely profitable. I have previously taken note of the unfortunate fact that our government has historically offered far more subsidies for fossil fuels than for renewable energy. Any student of corporate strategy will tell you that these subsidies make no sense. The fossil fuel industry is more than a hundred years old, and enormously profitable. Just yesterday, Exxon announced that its profits soared 53 percent over a year ago. There is a case for supporting the renewable energy business, with its large potential for growth and creating value for customers. But pouring more money into a commodity business with a limited supply will not increase the supply. There is simply no public purpose to be served by subsidizing the fossil fuel industry.